Tag line: "A Mighty Motion Picture Of Action And Adventure!" Simply put, Lawrence of Arabia is as grand a motion picture as I have ever experienced. While stationed in Cairo, British officer T.E. 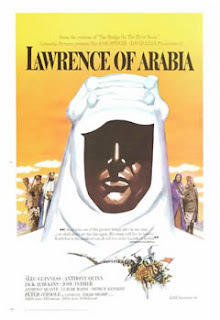 Lawrence (Peter O’Toole) is ordered by High Command to meet with Prince Feisal (Alec Guinness), an Arabian military leader, to discuss the Prince's growing concerns regarding the Turkish occupation of his homeland. Though officially restricted to the role of a liaison, Lawrence nonetheless finds himself sympathetic to the Prince's cause, and disobeys his superiors by volunteering to assist Feisal in his war against the Turks. To gain the trust of his new comrades, Lawrence commands a small contingency of Feisal's soldiers, guiding them across the treacherous Nefud desert, in the hopes of taking the port city of Aqaba, a Turkish stronghold, by surprise. The mission is a success, and to show their appreciation, the Arabs give Lawrence command of his own rebel army. With the help of other chieftains such as Sherif Ali (Omar Sharif) and Auda aba Tayi (Anthony Quinn), Laurence leads his men to victory time and again on the battlefield, and before long, the man known as "El Aurens" has put the entire Turkish army on the run. Even with the film clocking in at four hours, Lawrence of Arabia spends very little time getting to know its main character. It reveals nothing of Lawrence's early years, and aside from an opening scene showing us his death (the result of a motorcycle accident), the life he led following his service in the Army is completely ignored. Instead, the movie focuses on Lawrence's days in the desert, and the exploits that made his name legendary in that part of the world. History tells us, at some point during his time in the Middle East, T.E. Lawrence fell in love with the desert, so much so that he felt compelled to fight for it. In Lawrence of Arabia, director David Lean reveals, in sometimes striking detail, exactly what it was that Lawrence saw in this desolate corner of the globe. As Lean moves his camera slowly across the barren landscape, we, too, bear witness to the majesty of the place. We marvel at the elegance of a desert sunrise, and react with nervous anticipation as men are led across its dangerous, hot sands. Lawrence the man may remain a mystery when the final credits roll, but what inspired him to become a legend is laid bare for all to see. When writing about the film, critic Roger Ebert of the Chicago Sun-Times stated the experience of watching Lawrence of Arabia in its original format “is on the short list of things that must be done during the lifetime of every lover of film”. Even with the limited scope of my television, I've fallen in love with this movie. I can’t imagine how I'd react if I were to catch it on a huge 70mm screen. But, man...would I love to find out! Great review! Great movie. Lawrence of Arabia is one of the best! Alex: Thanks so much for stopping by, and for the kind words. And I agree with you: Lawrence of Arabia is one of the finest films ever made. I've seen it in 70mm, Dave. It truly is a miracle to behold. Alongside 2001 I believe it is the only film that MUST be seen big to be truly appreciated. While it's not my favourite film, I feel it is the best film I have ever seen in terms of quality of filmmaking across the board. @Dave: Thanks for stopping by, and for the comment! As I said in the review, it's one of the things I really want to do at some point. I can only imagine how spectacular it will be! I am taking a short break from watching the movie to agree with you about how wonderful it is. It's just amazing. Truly it is one of the best movies ever made. Maria: Thanks for the comment! I'm glad you're enjoying the movie, and I agree with you. It's one of the greats!